In 1977, waterbeds were popular, and they were gaining market share at the expense of innerspring mattresses. A college business student named Dennis “Denny” Boyd devised a business model for one of his classes. It was selling waterbeds. His fellow students and the professor thought it did not have a future, but Boyd Sleep’s 40 years of success have proved Denny Boyd right. The Bedroom Store selling waterbeds expanded into making sheets for waterbeds (regular sheets did not fit waterbeds). Then Boyd began making waterbeds (Boyd Flotation). After this came making and selling water conditioners for waterbeds (Blue Magic). Today, the Boyd Group has three companies, the Bedroom Store (retail), Boyd Sleep (bed manufacturing), and Blue Magic (water conditioners). Denny Boyd began adding adjustable airbeds, memory foam mattresses, and latex mattresses to his line of waterbeds. Since these were all alternatives to innerspring mattresses, the bed manufacturing business was renamed Boyd Specialty Sleep (“specialty sleep” mattresses are those without metal springs). Now the lineup includes hybrid mattresses, and the name has been changed to Boyd Sleep, a streamlined name with broader market appeal. Today, the Bedroom Store has several locations in the St. Louis area, and Blue Magic is the standard water conditioner for use with all brands of waterbeds.Boyd Sleep products are sold by retailers across the country, in stores and online, such as Home Depot, Amazon, Wayfair, The Waterbed Doctor, Eco-Mattress Store, Army & Air Force Exchange Service, etc. 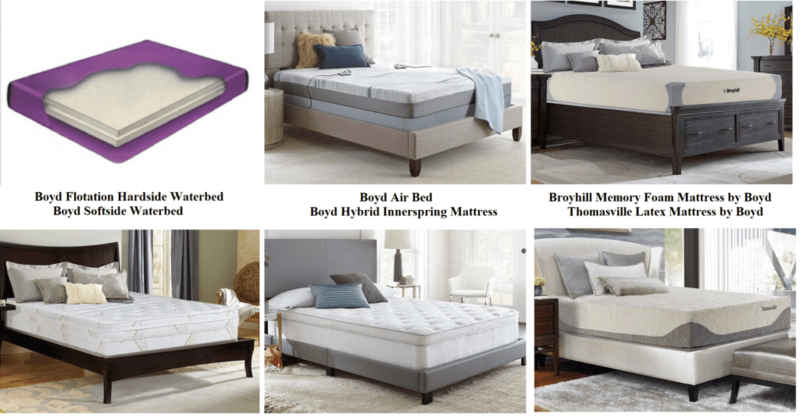 Boyd Sleep also makes products for other brands, such as Broyhill (memory foam and hybrid innerspring mattresses), Thomasville (airbeds and latex mattresses), and Simmons BeautyRest (Plush Aire inflatable mattresses). There are several Boyd Sleep products lines: Mattresses, Adjustable Bases, Platform Beds, Bed Frames, Guest Beds, and Sleep Accessories (pillows and toppers). The mattresses include Waterbeds, Air Beds, Memory Foam Beds, Latex Foam Beds, Hybrid Beds, and Guest Beds, as well as the iZone brand. This is the original Boyd Sleep product, still sold under the Boyd Flotation brand. Originally these were free-flow hardside water mattresses (those requiring a rigid frame – usually made of wood). Now Boyd Flotation includes softside waterbeds, as well as semi-waveless and waveless hardside waterbeds. Softside waterbeds do not require rigid frames, and can be put on ordinary bed frames as replacements for innerspring or foam mattresses. The support core consists of tubes filled with water. These run head-to-foot, providing motion isolation. The tubes can be divided among head, center, and feet for zoning and adjustable lumbar support (similar to 3/6-chamber airbeds). Boyd’s hardside waterbeds are usually listed as “replacements.” This means that these are waterbed mattresses, which can be placed within a new or existing waterbed frame. Waveless and semi-waveless waterbeds have layers of foam in the bladder to prohibit or restrict the flow of water within. The customer has a wide range of wave restriction from which to chose. After the introduction of home bedroom adjustable airbeds by Comfortaire in 1981, Denny Boyd saw that they would take market share from waterbeds. He designed his own airbeds. Boyd Sleep has its own Night Air brand, and also makes airbeds for Thomasvill Furniture. The original adjustable airbeds had one air chamber for the entire bed. Then came dual selection, with separate controls for right and left sides in a two sleeper bed (such as Queen and King sizes). Now Boyd Sleep airbeds have a choice of two or six chambers (one or three in single-sleeper sizes). 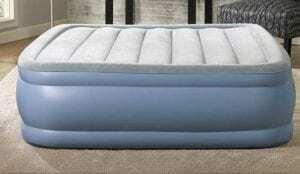 As of now, Boyd Sleep and Air-Pedic are the only top-rated manufacturers of 6-chamber airbeds. 1It was only natural for Boyd Specialty Sleep to begin making memory foam mattresses. The visco-elastic foam was introduced to the bedding market in 1991 by Tempur-Pedic, which has become the standard for this type of bed. 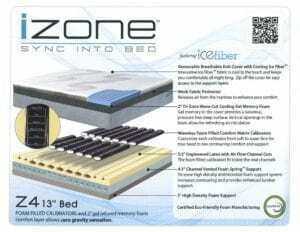 Boyd Sleep uses memory foam not only in memory foam mattresses, but in comfort layers of waterbeds (especially softside waterbeds and topsides for hardside waterbeds), airbeds, and now hybrid innerspring mattresses. It is also used in combination with latex in some models. Memory foam mattresses led to latex mattresses. Whereas memory foam conforms to the sleeper’s body and is slow to change its shape, latex is more resilient (has bounce), and recovers almost instantly when a sleeper moves. Many customers prefer the feel of latex to that of memory foam. Softer latex foam conforms more, providing some pressure relief. 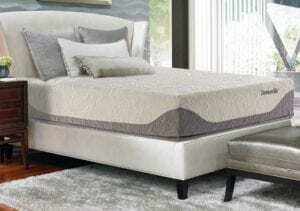 Latex mattresses and memory foam mattresses usually have support cores of firm polyurethane foam. Like memory foam, latex is used in the comfort layers of innerspring mattresses, waterbeds, and airbeds. In 2016, Boyd introduced innerspring mattresses into its lineup as part of it Thomasville licensed products. These were available by January 2017. These hybrid innerspring mattresses are part of the reason for the name change from Boyd Specialty Sleep to Boyd Sleep. The mattresses broaden Boyd’s market appeal, since any customers still refer the traditional feel of springs. Boyd Sleep hybrids use pocket coils, the most conformable coil type. They offer motion isolation, a key benefit of foam mattresses and dual support waterbeds and airbeds. Pocket coils are the kind best suited to compression rolling of bed-in-a-box mattresses. However, they still resist compression during use, meaning that they apply pressure to sleepers. Boyd Sleep has a line of beds and mattresses designed especially for guests. These beds can be quickly set up for use, then put away awaiting the next guest. Most of these are inflatable beds, and a few are thin foam mattresses (some with folding frames). Boyd also licenses inflatable guest beds to Simmons BeautyRest. Furniture and sleep product industry publications include Boyd Sleep among “Tier Two” mattress and bedding manufacturers. Yet they acknowledge it as a durable and innovative company. This is primarily because of the vision, adaptability, and inventiveness of its founder and head, Denny Boyd. Tier One and Tier Two are primarily distinguished by corporate size and sales volume. Tier One companies include giants such as Tempur-Pedic, Sealy (now merged as Tempur-Sealy), Simmons, Serta (now merged as Serta-Simmons), Kingdown, King Koil and Spring Air. Yet many Tier-Two mattress manufacturers, such as Boyd Sleep and Relief-Mart/Selectabed, are driving innovation and are leaders in customer ratings and satisfaction.